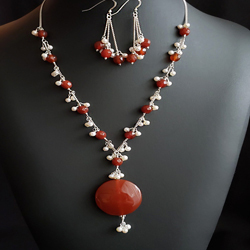 A large round, almost disk-like shaped natural Carnelian Stone (3.3cm x 10mm at widest point), is the focal point of the necklace, accented with fancy daisy beads and clusters of little 4mm round white freshwater Cultured Pearls, then wire wrapped to 8mm round faceted natural Carnelian stones, each accented with 2mm round Sterling beads, attached to upcycled sterling chain and spring ring clasp. Necklace measures 20″ in length and it can be shortened if requested. The earrings each have three strands of chain with the same 8mm Carnelian and small pearls dangling on the ends. 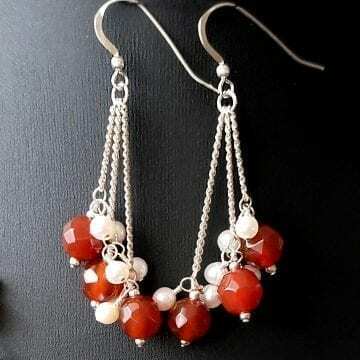 The earrings dangle on French style earring wires. The earrings measure 4.6cm from the base of the earring wires, but, the total length is 5.7cm. 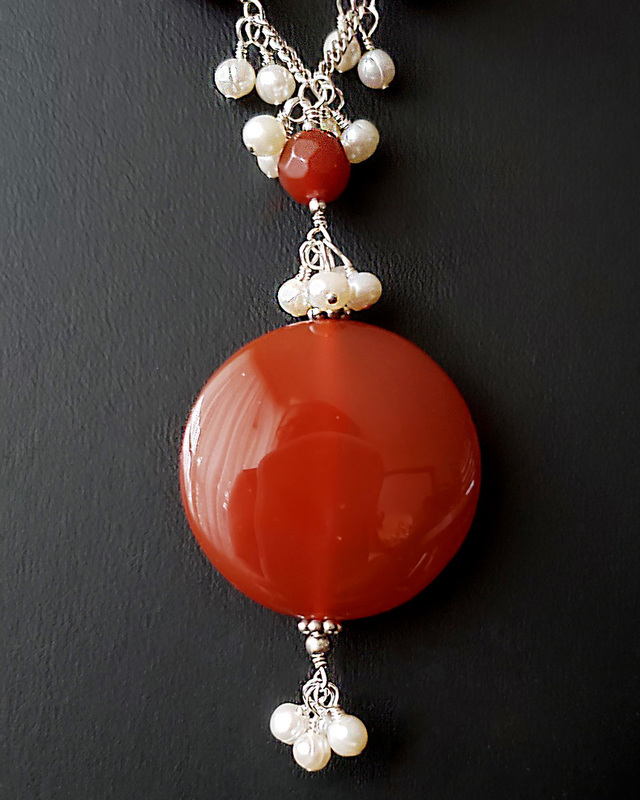 To see my jewellery is to catch a glimpse of my soul. My wearable, three-dimensional art transforms as it moves and becomes one with the body. Movement helps the light reveal textures, colors, lustre and sometimes reflects to create magical sparkles like stars twinkling in the nights sky or sunshine on the water. Transformation is a major theme in my work, not only the journey from raw materials to finished piece, but also transforming old into new, negative into positive, pain into beauty. I love to use something broken and discarded to create something beautiful and desirable. I am inspired by nature, water, art, people, my faith and all things beautiful. I am always conscious of the world around me as I create, so I try to use eco and animal friendlier materials and methods of construction, to upcycle vintage gemstones, silver and other jewellery materials when possible, combined with new. This brings harmony to my work and contributes to my eclectic designs. 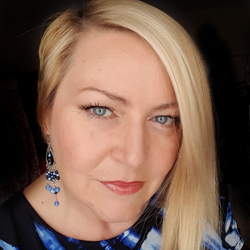 A life long passion for collecting and restoring antique & vintage jewellery has given me a unique perspective for creating enduring wearable art that will continue to express my joy many years into a bright future.